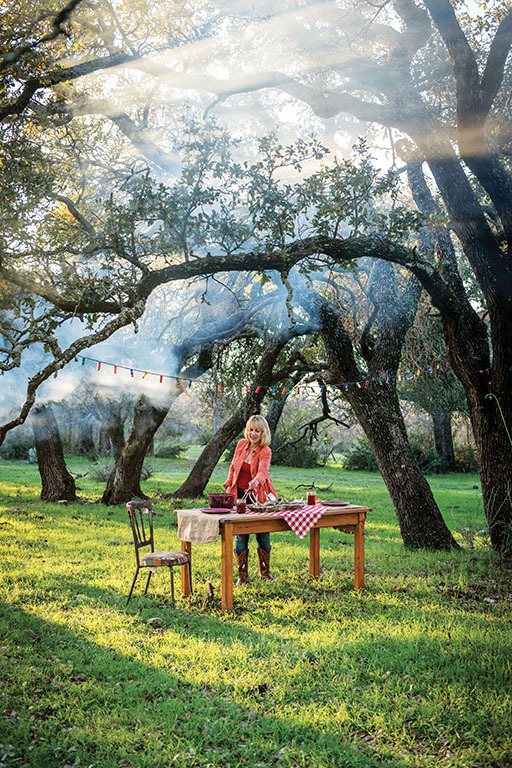 Ebert’s passion for cooking and entertaining begins with wild, organic ingredients, which she gathers, hunts and fishes from the diverse, bountiful Texas landscape. Photo by Wyatt McSpadden. My best junk store find of all is a distressed wooden farm table with screw-on legs that I sanded and refinished. Legs off, the upturned top slides into the bed of our pickup where coolers of food and crates of linens, plates, and silverware can be transported on top of it, and the table sets up easily afield. In lieu of a trip to the florist, consider fashioning a centerpiece from native plants such as pine boughs, pinecones, grapevines, and fall fruits and berries. I like to fill a metal tray with assorted sizes of Mason jars and jelly jars, with a bright-colored votive candle in each. When an electrical outlet’s handy, count on me to pull out a few strings of Christmas mini-lights — I hot-glued spent shotgun shells over the bulbs on one of the strands. For tired table linens that need more “oomph” than tea-staining, I like to use the fiber-reactive tub dyes from Dharma Trading Company, which result in brilliant Southwestern colors that won’t run or fade.